Computrols LX controllers (datasheets available here) are the culmination of years of research and development. LX brings the latest computer and electronics technology right to your facility, effortlessly integrating into your existing Computrols Systems. So why upgrade? Let CBAS do the rest for you. Sure, there are a host of new features and advantages with the new LX but you can take your time enjoying these new features. Meanwhile, getting started with LX is as simple as plug-and-play. The computer at the heart of the LX controller is a quantum leap in processing power and storage. All the technical specs are hundreds and thousands of times better than our classic X controller. Of course these are just numbers on a page. What does that mean for building control? Faster logic statements – run all logic every second! Many more onboard features than ever before! In a world of ever-increasing concerns over network intrusions, the LX brings unprecedented security features to an HVAC controller. Under the new LX, all the controllers and computers can be configured to communicate using Secure Sockets Layer (SSL). This industry standard protocol uses strong asymmetric cryptography that was impractical to implement at the controller level before now. So rather than relying on your internal security (as you do with a classic BAS network), a network of LX controllers can reside on any network, anywhere, anytime. It can even have a static IP on the Internet. So reduce your security risks and enjoy the freedom of easy networking. Computrols products have a reputation in the industry for being easy to install. Features like jumbo screw terminals, two-board design and 4-in-1 points help to fortify this well-deserved reputation. So it is no surprise that advances in our 4-in-1 circuitry have taken the Computrols “easy installation” to a new level. When it first powers up, the LX goes into “Protection Mode” to prevent any damage to the controller or end device. Next, it interrogates the terminated wires looking for problems. If something’s not right, it stays in protection mode and lets the installer know of any problems. In any case, Wire Check has your back. Whether you’re using a Computrols Hand Held Terminal (HHT), Android device, or CBAS Graphics Workstation, points with incorrect wiring are clearly displayed. “Wire” becomes the status of the point. Just correct the mistake and the status clears and begins updating. Wire Check, just another way that Computrols saves you time and money, making your life easier. The new LX controller’s standard features include a high-speed USB 2.0 serial port. USB has become part of the Computrols vision of what modern equipment controllers should be, and opens a doorway of possibilities. Integrate thousands of plug-and-play devices on or near your equipment. Would you like to back up your database? No problem, just plug in a USB flash drive. Would you like to use a webcam for a live view the equipment? WiFi? BlueTooth? Printer? The list of supported devices is impressive and growing. The power and speed of the LX is just the beginning. The LX core runs an embedded version of its modern operating system. As standards, protocols and device drivers are released, Computrols updates the LX software. Integrate and go! Are you ready for the Internet of Things (IoT)? We are, and we can’t wait to bring emerging technology to building automation. Although you can still use the trusty Computrols Hand Held Terminal, the LX showcases a new app that can do everything that the HHT can do, and more. The Android platform gives the app the widest selection of mobile devices on the market. You can load it onto your compatible device or get a Nexus 7 from Computrols that is preconfigured and ready to go. The app is plug and play – simply use your Android device to set the LX IP address, view your inputs, or control your outputs. Modern and convenient. There is no easy way to monitor or make changes. It’s not cost-effective to have specialized software available for one controller. The history is unavailable. If there is a problem and service is required, there is no record of the problem or the conditions leading to the problem. LX will make you rethink how you monitor and control satellite facilities and equipment. One controller – a single piece of equipment – with the power of a full automation system. 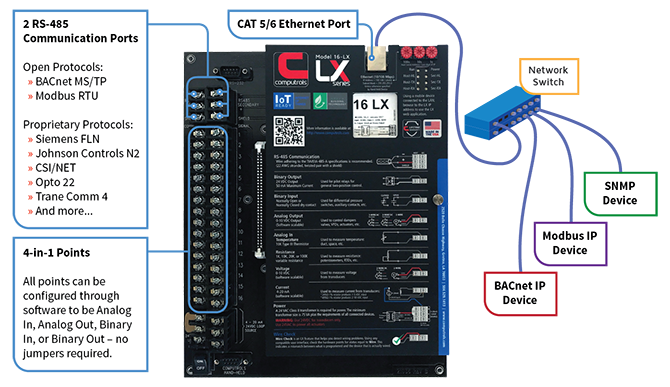 Unlike the single processor on X-Line controllers, the main computer on the LX is dedicated to higher-level control, networking, and automation intelligence. Data sampling, data output, communications, and other low-level functions are off-loaded to several high-speed dedicated microprocessors. Each bank of 8-points has its own 50 MHz microprocessor. This gives LX points a very high speed input sampling rate, sophisticated noise filtering, and a host of pulse counting and pulse generating options. And for communication, each serial port also gets its own dedicated microprocessor. This makes protocol interfaces to devices running Modbus, BACnet and OPTO that much faster, cleaner, and more reliable. Whether it’s VFDs, electrical meters or VAV controllers, LX serial ports are up to the task. Want to see what you’re missing? View the X / LX Comparison Charts. The 64-LX provides the best solution for largest air handlers and other equipment requiring up to 64 points. The 32-LX provides the best solution for large air handlers and other equipment requiring up to 32 points. The 16-LX provides the best solution for medium air handlers and other equipment requiring up to 16 points. The 8-LX provides the best solution for smaller air handlers and other equipment requiring up to 8 points. Download a comparison of the features of our X-Line controllers to our newer LX-Line.